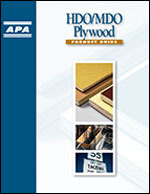 APA sanded plywood is particularly useful in commercial office fixtures, display cases, furniture, cabinets, built-ins, shelving and similar applications. Sanded plywood has a beautiful, finish-quality surface for visible applications. And since it is sanded at the mill, little or no sanding is required for most applications. Easy to paint attractively, plywood contributes the warmth and natural beauty of real wood while meeting project cost constraints. In addition, APA Rated panels are exempt from U.S. EPA and California formaldehyde regulations due to their very low emission rates. For information, visit our formaldehyde page. For applications in which the panels will be painted or laminated over, Medium Density Overlay (MDO) plywood is a strong choice. MDO is often used for cabinets and built-ins, paneling, wainscoting and partitioning, particularly for shelving that may be exposed to water. MDO is an ideal base for paint and tolerates exposure to wetness when finished. Although it performs perfectly well without further finishing in applications where it is not exposed to water, MDO should always be face-primed and top-coated with a compatible solid-color stain or paint if subjected to wet or humid conditions. Some producers of MDO offer panels with a pre-primed surface. Follow the panel manufacturer's recommendations for stains and paints, such as the staining used for the tables in this restaurant. Both plywood and OSB are becoming increasingly popular in exposed commercial applications as a cutting-edge design trend.